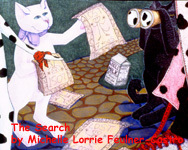 Michelle Lorrie Feulner-Castro splendidly illustrates a delightful, children’s book written by William Leavengood titled, Cat Moon Do. She created the artwork for this book using a technique she developed, which she calls mosallage and unlike conventionally illustrated children’s books, this one uses a large format for all of her artwork. Expert artist Michelle Lorrie Feulner-Castro creates these extraordinary works of art by combining various types and textures of paper, colored pencil and artifacts such as newspaper clippings, caution tape, and yarn. Three years in the making, you can view these marvelous illustrations which are on display at The Art Center, with Michelle as the featured artist. Details to be posted soon. Click on the photographs to go to additional web pages. To view full size images go to Book then click on the images. To sign our Guestbook go to Information then scroll down to the bottom of the page.